Those with access to physical paper encountered quite a splash on the cover of this morning’s New York Times. 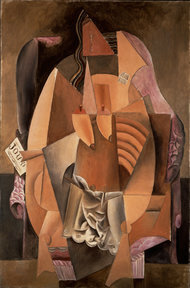 Leonard Lauder, the eldest son of Joseph and Estée Lauder, donated cubist art appraised at approximately $1 billion dollars to the Metropolitan. The collection was donated with no strings attached. The Met may curate the pieces in any manner that suits their sensibilities. A public exhibition is scheduled for Fall 2014. Art lovers are probably familiar with Leonard’s younger brother, Ronald. He is the owner of the Neue Gallerie on the Upper East Side. That museum sits a few blocks from the future home of Leonard’s cubist masterpieces. Both men started to collect early in life. Ronald bought his first Egon Schiele with bar mitzvah money. I will say this about the Lauders: they know what they’re doing. A specialized collection is much more interesting than an assortment of art. Ronald specialized in German art in general and German expressionism in particular. This narrow focus produced one of the finest collections of that sort in the world. And while his wealthy peers made big splashes as Christie’s gavels dropped, Leonard quietly built what could possibly be the finest collection of cubism in the world. While me may take issue with the rules in this game, it’s hard to say they don’t work to the public’s benefit. A private collection is about to go public in one of the finest museums in the country. We’re all slightly richer for it.